A few weeks ago Roy was out fishing with Steve when whilst trying to retrieve a fish off the line with the net, one of Roy’s hearing aids got flicked out and was duly deposited into the sea. Oh no! But more importantly they got the fish, a decent sized one at that too!! Over the next few days came the task of phone calls to insurance companies, then the hearing specialists with appointments made to have the aid replaced. After a week or two of waiting to hear from the insurance company we were finally notified that all was ok and to go ahead to have the aid replaced so off we went to the Audiology centre. Of course regular readers will know what is coming next…….. in true Vannini fashion, it wasn’t going to be that easy. Roy went to his appointment expecting to be given a new hearing aid but no…apparently the old aids are no longer available as they have been superseded and as well they are “paired” to each other so a replacement was out of the question instead he now needed a complete new set. Eeek, this is turning into an expensive fishing expedition! However, between the audiology centre and the insurance company they came to a mutual agreement, unbeknown to us, that a complete new set of hearing aids was essential and should be covered by our policy. Hence a new set of aids had to be prepared and set up which meant another appointment was made to have them fitted. A week later we trundled back across the bridge to have the new hearing aids fitted. Roy having the new aids tested and set up correctly….all done by computer! 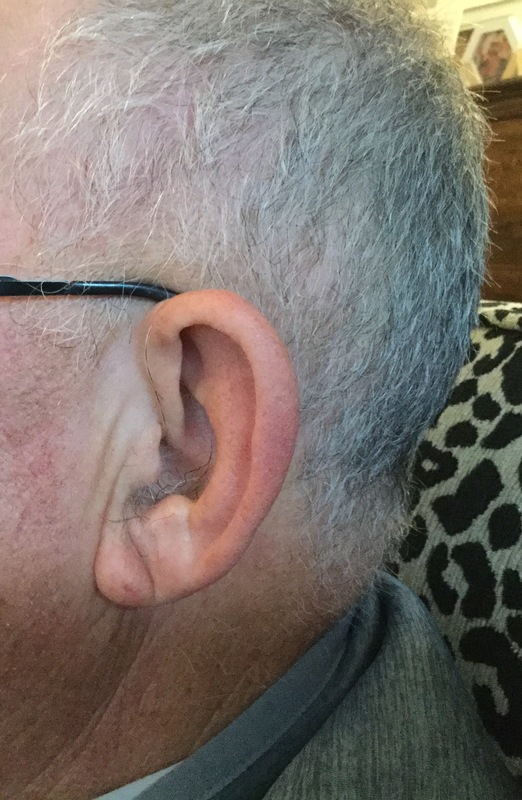 Just like his old aids, they are pretty hard to see when he is wearing them as all you can see is a fine, clear tube going into his ear, it almost looks like a piece of fishing line….or a grey hair! with a very small piece which is fitted over the back of his ear and is only obvious if you are looking for it. Very close up view of the fine wire disappearing inside the ear. The new aids are really flash and are very, very, clever. They are bluetoothed to any or all of our iOS devices which means Roy can have his phone and iPad linked directly to the aids. The controls for the aids are on his phone as well via an app he has downloaded. Each hearing aid has individual volume controls for each ear, which can be controlled either by the controls on the aids themselves or via his phone, as well as adjusting bass, treble etc. This technology also enables him to stream movies/podcasts directly to his hearing aids. He can also change programs and they have a sound enhancer so he can adjust them for when he is in a crowd, he can alter them specifically for speech by focussing the direction, they have a wind noise adjustment, and even a tinnitus manager!! and a white noise input with noise cancelling ability. As well he can have it so that when his phone rings, it rings straight out the hearing aids. BUT the best thing of all is they have a finder-search function for each individual aid and a last location finder!!! That will be a godsend particularly when one gets lost as he did in this instance. I tell you, they are pretty damn clever and his hearing will of course be better too. His old hearing aids were bluetoothed to a device which was attached to the TV but these days we don’t use the TV. Rather, we have been watching most things on the iPads by using a splitter plug, with Roy’s headphones plugged into one connection and a small external speaker in the other port for me. However, this is all about to change. Currently one device at a time can be attached via Bluetooth to any one device so for instance Roy can listen to something via his hearing aids but I cannot connect to the same device with my wireless headphones. However, help is on its way as we can get a Bluetooth splitter device. This has been ordered and is on its way and should arrive any day. With the splitter Roy can have his hearing aids tuned in and I can use my wireless headphones and we can each have the volume adjusted to our own preferences. Clever eh?! 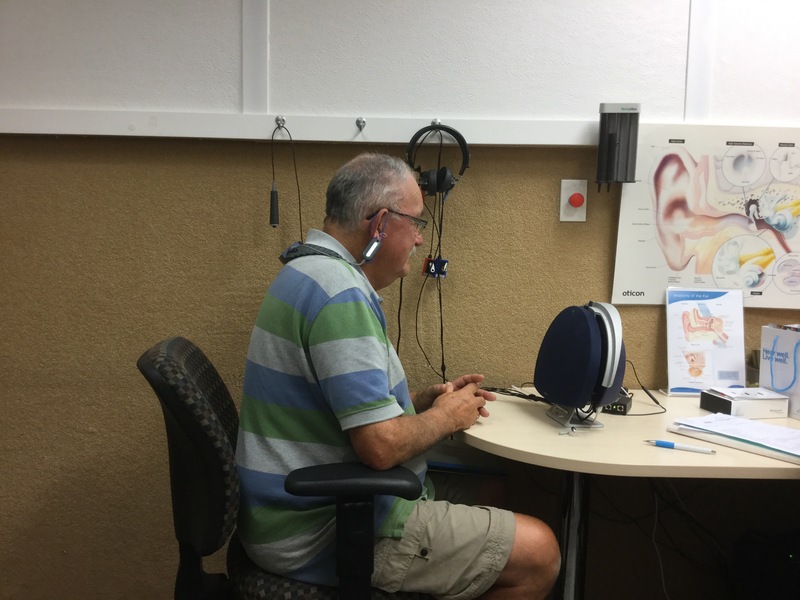 He has had them for a few weeks now with just one return visit to the audiologist in Auckland to have one of the aid levels adjusted as it was creating a bit of feedback noise. We have since been at Uretiti enjoying the sunny north when one day Roy decided he needed to change the grommet on the aids. The grommet is the very small, black, rubberlike device that sits in the ear canal and I do mean small. Combined with large fingers the outcome was not going to be great. Yep, you guessed it, next minute we are crawling around the floor to try and find a dropped piece. And yes, our flooring is black, and no we could not find it. We even resorted to vacuuming the entire floor and then seiving through the detritus to try and find the elusive little thing. However, we had no luck in finding it. This whole scenario repeated itself a couple of days later with the same result. Obviously he was doing something wrong so as we were heading into Whangarei the following day we thought we would call into the local branch of Bay Audiology to see if they could help. Besides, he was having a bit of trouble with one of the aids sitting uncomfortably in the ear so they could sort that out as well. Off we went into Whangarei and straight to Bay Audiology, where on inspection they said, wait a minute, there is a grommet stuck in your ear! No wonder things were not feeling comfortable! We then had to go to another specialist hearing place to have the offending grommet removed safely. Luckily they had a free appointment later in the morning so we made our way there. Yes, he had a grommet stuck in his ear which was easily retrieved with a specialised tool, but hello? What’s this? Yep, you guessed it, there was not one, but two grommets stuck in there!!! No wonder the hearing wasn’t the best in that ear with two stuck grommets and a third in the actual hearing aid making things sound decidedly muffled! I told you things were never straight forward with the Vannini’s! So no longer will you see Roy going off on his walks with his headphones on connected via a wire to his iPhone whilst he is listening to podcasts, you will just see him wandering along……just don’t try to talk to him as he will probably be intently ﻿listening to a podcast.